Visible Cloaks, Yoshio Ojima & Satsuki Shibano - FRKWYS Vol. 15: serenitatem. Vinyl LP, CD. Bleep. 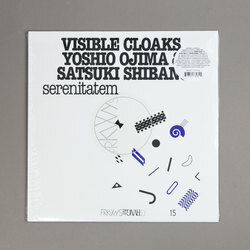 After releases from artists including Kaitlyn Aurelia Smith, Robert Aiki Aubrey Lowe and Julianna Barwick, the fifteenth volume of RVNG Intl.’s FRKWYS series sees Visible Cloaks unite with two legends of the Japanese avant garde to create serenitatem. Both composer Yoshio Ojima and pianist Satsuki Shibano have been active in the worlds of discrete, ambient and environmental musics in their home country. This scene has had a profound effect on Visible Cloaks’ output, and as such this joint LP feel very natural. In other hands the beautiful keyboard work here would lead to a set of pretty ambiences, but while this record remains a lovely listen the real genius of serenitatem is the quirk that everyone involved brings to the compositions. The random cells of melody and computerized sound which pepper the textures here place serenitatem alongside Actress, Oval and Oliver Coates.